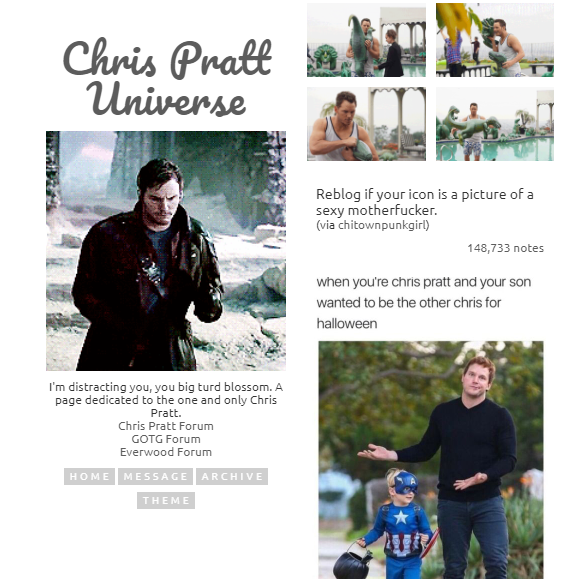 Fan Forum > Male Celebrities > Chris Pratt > Please Welcome Our New Affiliate "Chris Pratt Universe"! Please welcome to the family Chris Pratt Universe one of the best online sources for celebrating Chris Pratt. Feel free to visit their site for information about Chris Pratt and Guardians of the Galaxy. In addition, his role in the Jurassic World Films and his role in The Passengers! You can find the link to Chris Pratt Universe above, at the bottom of the forum and also on our affiliates page here. Feel free to visit, like and share! I think it's out first affiliate! it's nice to have you here. Welcome aboard!